Behind the clash of the Titans, Boeing and Airbus, helicopters were rather discreet during the 2017 edition of the Paris Air Show. But the major aerospace event was hardly a bore: several concept aircraft showcased during the tradeshow gave us a glimpse of the future. Read on for a look at three iconic examples. w saw the first exhibition of a passenger-ready drone. The SureFly, marketed by Workhorse, is spearheading a new trend whose scope is difficult to estimate, but which is sure to continue to grow over the coming years. From Europe, passenger-transport drones may still seem like something out of a science fiction movie, but there are places where the authorities fancy themselves visionaries, places where the drive to pull ahead in the 21st-century technology race is a powerful motivator. Workhorse is no novice: the company specializes in electric delivery trucks and has been working with UPS on drone-powered deliveries in rural areas by combining trucks with automatic. By replacing packages with passengers, Workhorse is determined to get a foothold in the 21st century mobility market. SureFly features a hybrid propulsion system: a 200 CV Honda gasoline piston engine powers eight electric motors, which are placed in pairs at the tip of each of the craft’s four arms. Each electric motor powers its own propeller. If one motor malfunctions, SureFly automatically lands with the remaining seven. If the piston engine malfunctions, the rotors stop working, but a backup battery provides enough power for emergency landing. 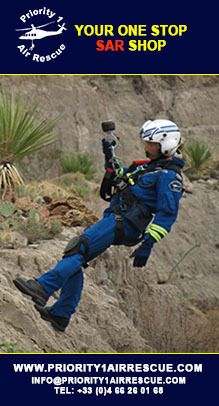 An emergency parachute that can be deployed automatically or manually provides additional safety. SureFly can carry a 200-kilogram payload, with an autonomy of just under 100 kilometers at a speed of 80 km/h. Workhorse envisages SureFly as an airborne taxi running very short distances—about 15 kilometers at a time. Flight trials should begin this year, and the company hopes to obtain FAA certification of the piloted version of the aircraft by 2019. Maybe the next Paris Air Show will see it unveiled! This 700-kilogram aircraft is the spearhead of Airbus’s offensive launched on the rotor-wing drone segment, currently divvied up between two major players: Austrian manufacturer Schiebel and the American company Northrop Grumman. Schiebel got things started with its Camcopter S-100, which weighs in at about 200 kilograms. Northrop Grumman decided to invest in a much higher weight category with its Fire Scout MQ-8C, based on the Bell 407 airframe—its operational weight is about 2,700 kilograms. But between the two, which are now operational, there’s a void. A void that Airbus has started to fill with the VSR700. 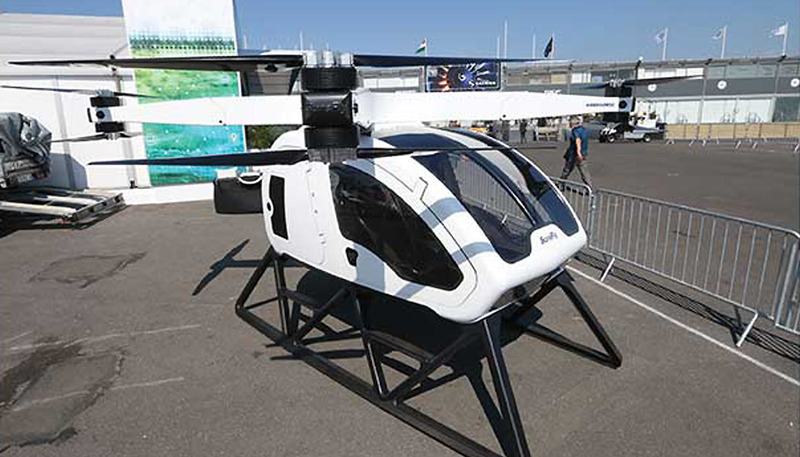 “We aim to provide performances on par with those of the Fire Scout—about 10 hours of autonomy and a payload of 150 kilograms—on an aircraft four times lighter,” explained Régis Antomarchi, who heads up the VSR700 program at Airbus Helicopters. The key to success? The choice of a diesel engine (still undergoing fine tuning) that’s much more economical than the Bell 407 turbine. “Our drone will use 15 kilograms of fuel per hour, compared with 75 to 80 kilograms for the Fire Scout,” continued Antomarchi. 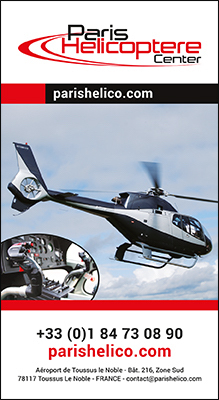 The VSR700 is based on the Cabri G2 by Guimbal, which provides the airframe, motorization and moving parts. 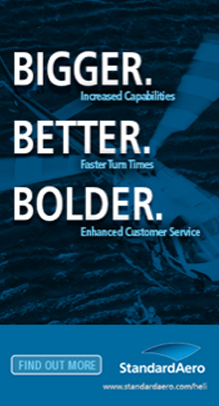 Airbus Helicopters will provide the flight systems: autopilot and vehicle management and navigation systems. A first OPV (optionally piloted vehicle) version completed its first flight on May 15, 2017 with a safety pilot on board. 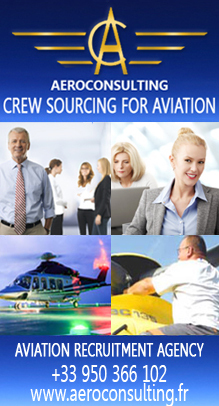 Throughout the development phase, the pilot’s presence on board will enable the programmers to clearly define the piloting code with low risk. Most of the work will be done on test benches, with flights added in to confirm the viability of chosen solutions in a dynamic environment. As early as next year, two remotelypiloted prototypes will follow in the footsteps of the OPV. They will feature the finalized architecture for the aircraft, with, most notably, a reduced front section compared with the Cabri, since there will be no need to seat two people side by side. During the Paris Air Show, the VSR700 model was presented with a wide range of possible configurations: radar and optronics (which can be installed together), ocean rescue kits or Thales acoustic buoys (smaller size suitable for VSR700 still under development) for anti-submarine warfare. The French Navy does not currently plan to arm its drones. The French Navy has been testing the Camcopter drone for several years, and is now convinced of its operational usefulness. With its 10 hours of autonomy (eight hours when stationed 100 nautical miles from a ship), the VSR700 would nicely complement the maritime surveillance work of two NH90s. France’s Navy is currently pushing for the launch—as soon as possible—of the SDAM (Navy Aerial Drone System) program, which would lead to the acquisition of several drones, which would come online between 2020 and 2025. Beyond France’s armed services, the future of the VSR700 will also depend on exports: Airbus Helicotpers recently announced the signature of strategic agreement with Naval Group (formerly DCNS) to equip all ships built in France in the future with a drone system. “All countries with a modern navy and frigates have similar needs. 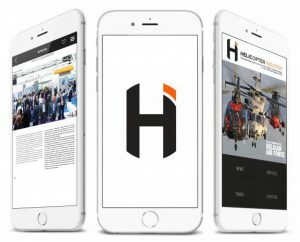 They’re considerable on a global scale,” explained Antomarchi at Airbus Helicopters headquarters in Marignane. 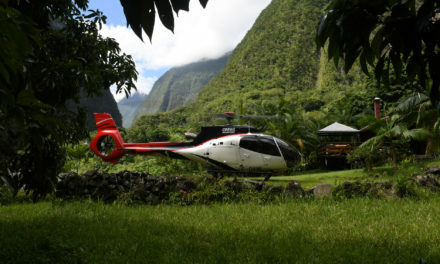 On the heels of the X3 success story, complete with world records and an American tour, Airbus Helicopters made it clear that the company intended to continue the adventure with an aircraft they could bring to market. European research initiative Clean Sky 2 gave the group the economic context needed to pursue development, and the manufacturer has been using its communications expertise to drum up a lot of buzz over the past few months by publishing a series of enticing illustrations in the media. On the opening day of the Paris Air Show 2017, a press conference unveiled more details on the current status of the project, which is much more advanced than Airbus Helicopters had led anyone to believe. The Racer’s aerodynamic configuration has been finalized for months already, following a battery of wind tunnel tests performed in the United Kingdom and Germany beginning in early 2016. 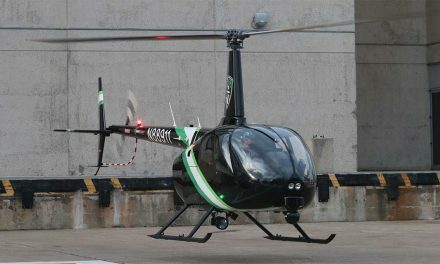 The X3 did its part to shake up the norms of rotorcraft design, and Racer has continued in the same vein, though it features several spectacular differences from its predecessor, to improve efficiency. The Racer will feature a biplane configuration with a pair of propellers. For Tomasz Krysinski, Head of Research and Innovation at Airbus Helicopters, nothing has been left to chance: The idea of using wings to relieve the rotor at high speeds is still on the table. But the problem with a big wing, with a big chord, is that the wind created by the propeller pushes on it during vertical flight. The stronger the rotor is, the harder it pushes down on the wing and the entire aircraft. Reducing the wing’s chord put an end to the vicious cycle. But, to keep the same lift surface, Airbus Helicopters decided to implement a biplane design, with wings that come together at the engine nacelle. The surface is greater than that of a monoplane design, which boosts cruising efficiency. The wings are also placed further back on the Racer than on the X3, which makes getting in and out of the aircraft easier passengers. 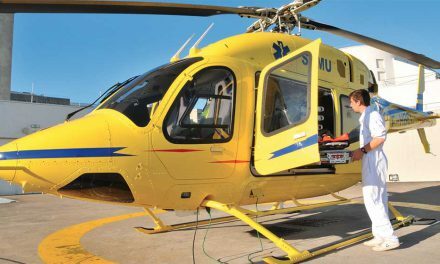 The choice of push rotors also fulfills two requirements: it increases operational safety when entering and exiting the cabin, and improves efficiency by 10% according to Airbus Helicopters. The improved aerodynamic efficiency the helicopter manufacturer claims to have achieved is intriguing to say the least, given that the flow of air to the propeller is interrupted by the wings. The lower wing also houses the landing gear, providing a wider stance and improved safety for ground operations. “The sturdiness provided by the stacked wings also impacts power transfer from the two turbines to the wing propellers, which can be simplified to reduce weight,” explained Krysinski. Lastly, it’s worth noting that the lower wing will feature mobile surfaces on the demonstrator, but it remains to be seen whether they will make the cut for the market version. 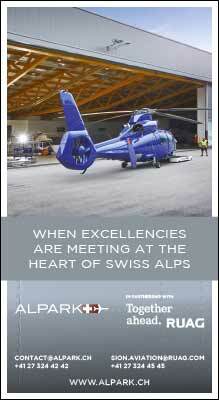 The Racer will be powered by two RTM322 turbines by Safran Helicopter Engines. According to Tomasz Krysinski, the Racer should easily manage a 200-knot cruising speed. Moreover, it should be able to maintain a speed of 180 to 190 knots in eco-mode, running on only one engine, with the other on standby. 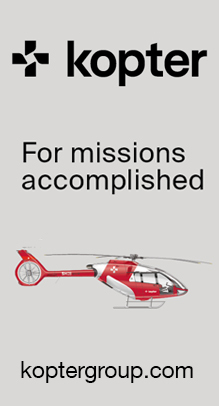 In this configuration, the aircraft’s fuel consumption would be significantly lower than that of a traditional helicopter flying at a speed of 140 knots with two active engines. Safran Helicopter Engines has been working on the project for several years, with an aim to designing the system so that the standby engine can be reactivated very quickly if need be, thanks to a custom generator. According to Airbus Helicopters, final assembly of the aircraft will begin in 2019. The European manufacturer does not wish to cite expected operating empty weight or payload weight, specifying only that the Racer will be marketed in the medium or super-medium category. Brussels has approved the financing scheme for the Airbus Helicopters X6, the aircraft set to replace the H225 family in the heavy helicopter segment. Paris and Berlin will lend Airbus a total of .377 million in repayable advances over a period of eight years (€330 million from France, €47.25 million from Germany). 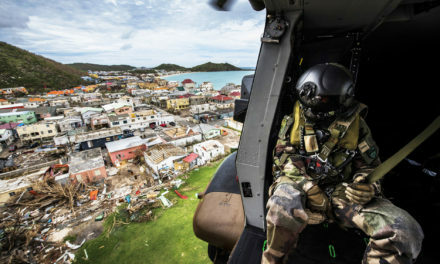 In a press release justifying its authorization of the loans, the European Commission noted that, “the scope of the X6 project and associated risks mean that the investments required exceed the self-financing capability of Airbus.” The X6 will be a twin-engine fly-by-wire helicopter like the NH90, with a cutting-edge avionics suite and next-generation turbines. The X6 concept phase was officially launched at the 2015 edition of the Paris Air Show, by Airbus Helicopters CEO Guillaume Faury. He suggested that the development phase would follow the initial two-year period, for the helicopter to enter service in 2020. It now appears that this schedule was slightly overambitious, since the concept phase has not yet been concluded. Sales are now expected to begin in 2025. After developing the T129 Atak, in close collaboration with Leonardo, Turkish Aerospace Industries (TAI) is now moving on to the commercial helicopter sector with its T625 project: a six-ton (12-passenger) twin engine, whose first flight is scheduled for September 2018, with certification expected 18 to 24 months later. The T625 will be a civil aircraft, but a military version is also in the pipeline, with a view to handing medical evacuations, transportation and rescue missions. TAI plans to sell around 300 T625s in Turkey over the next 15 years and to export another 500 over 25 years. But that’s all theory for the moment. The rotorcraft does not yet have a launch customer, but there’s no doubt the Turkish government will eagerly take up the role, particularly given that TAI’s goal is to develop a comprehensive range of helicopters to compete with the current players on the Turkish market and make the country more independent in that area. with another run of at least 10 aircraft.